Inspiring teaching resources, school improvement tools, and training and CPD to support literacy throughout your school or setting. Access online training courses and benefit from generous discounts on literacy training and CPD. Plan and evaluate literacy in your school or setting with our Annual Literacy School Review, Annual Literacy Research and Policy Guide and Annual Literacy Pupil Survey. Access teaching resources full of tips and practical tools to help keep your pupils engaged and save you vital time with lesson planning. Generous discounts from partners, such as Browns Books for Students, the School Library Association, First News, The Day, Teach Primary and Teach Secondary. Be the first to hear about our latest programmes and competitions and join networking events to share best practice with others in your area. Opportunity to use the Working with the National Literacy Trust logo across communication materials to demonstrate your school’s dedication to literacy. Create an account for a personalised experience with all the latest literacy programmes, research and resources you’re most interested in appearing on your dashboard. If you’re training to be a teacher, use the latest literacy research and engaging teaching resources to complete your assignments and develop outstanding teaching practice. 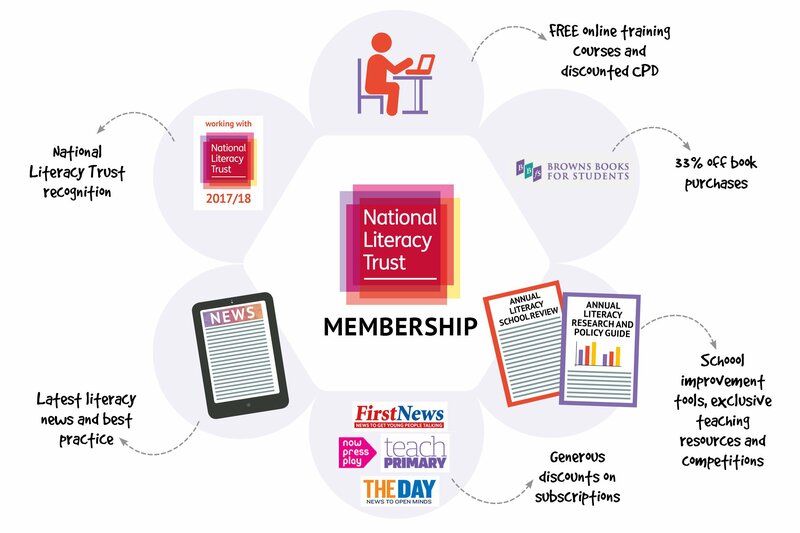 Easy access for staff to fantastic teaching resources, discounts on our CPD and a way to show your commitment to literacy with National Literacy Trust certification. For local authority offices, school improvement teams, library services or third sector organisations. Review your literacy provision with our audit tools and promote best practice with evidence-based resources and guidance. Individual membership is available at a cost of £90 for independent literacy advisers and self-employed consultants.